It was an exciting Saturday in Sudbury for 14 year-old Mike. 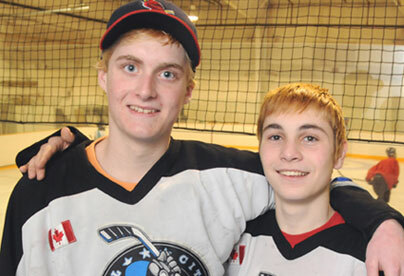 He was playing in a 3 game series with his hockey team, the Nickel City Sons AAA. They had just won their first game in the series and he was relaxing with his team during lunch, prepping for the next game. Suddenly, panic broke out in the dressing room. Pat, Mike’s teammate was in distress and another teammate called for help. “Pat was choking on Skittles,” remembers Mike, who jumped into action. Just one day before, Mike had learnt CPR in his physical education class at Lasalle Secondary School. With his new skills fresh in his mind, he started performing the Obstructed Airway Maneuver on Pat. “I kept calm and did abdominal thrusts about 3 times and he just coughed it out,” recounts Mike. Pat is thankful that Mike had the skills to save his life. “Some of our other teammates laughed it off, but, if I had died or something it would have been a big shock for them,” says Pat. “Thanks to the ACT Program, I knew the steps of what to do first, second and third,” says Mike. The ACT High School CPR Program was made possible in Mike’s school thanks to generous community and provincial-level support that enabled the donation of mannequins, teacher training and curriculum resources. The lead community partners in Sudbury are Inco Limited, Sudbury Regional Hospital Emergency Physicians, and Tracks and Wheels. Provincial partners of the Program are the Government of Ontario and The Ontario Trillium Foundation. The Advanced Coronary Treatment (ACT) Foundation is an award-winning, national charitable organization dedicated to establishing CPR in high schools across Canada. ACT raises funds to donate mannequins, teacher training, manuals and other materials to schools, and guides schools in program set-up and long-term sustainability. Teachers teach CPR to their students as a regular part of the curriculum. Over 1.8 million youth have been trained in CPR through this lifesaving program to date. ACT’s health partners (AstraZeneca, Bristol-Myers Squibb Canada, Pfizer Canada and sanofi-aventis) support the program in Sudbury, throughout Ontario and across Canada. They provide ACT’s sustaining funding and are committed to the Foundation’s national goal of promoting health and empowering Canadians to save lives.